To Cite: Jamshidi K, Jabalameli M, Jafari D, Najd Mazhar F, Gharati H. Endoscopic Treatment of Aneurysmal Bone Cyst of Proximal of Hummers , Shafa Ortho J. 2014 ; 1(3):e12345. Abstract: Locally destructive aneurysmal bone cysts are bloodfilled reactive lesions of bone and in spite of destructive nature, are not considered to be true neoplasms. The accepted treatment for this lesion is curettage and bone grafting. Endoscopic curettage without bone grafting has been reported recently in treatment of aneurysmal bone cysts without aneurysmal dilatation and for small lesions. We present good results with endoscopic curettage without bone grafting in two patients with large and expanded aneurysmal bone cysts of the proximal humerus. Aneurysmal bone cyst (ABC) is a bloodfilled reactive lesion of bone and in spite of locally destructive nature is not considered as a true neoplasm. Any bone may be involved, but the most common locations include the proximal humerus, distal femur, proximal tibia, and spine (1). The etiology of this lesion is unknown. Treatment methods include surgical excision and curettage with or without bone grafting. Unfortunately, a recurrence rate of 30–40% has been reported with these methods (2). Cryosurgery, embolization and the insertion of pins or demineralized bone graft also has been reported in treatment options of ABC (3). Endoscopic curettage without bone grafting has been proposed in treatment of atypical aneurysmal bone cysts without aneurysmal dilatation (4). This technique also has been used for treatment of ABC in small bones of foot (5). However, to the best of our knowledge there is no report of its use in treatment of large size ABC at the proximal end of humerus in the literature. We present two cases of very large and expanded ABC at the proximal end of humerus which were heeled after endoscopic treatment without bone grafting. A17yearold female right handed student referred to our hospital with swelling and mild pain in her proximal right arm since 3 months ago. Family and past medical history revealed no noticeable problem. Physical examination was normal except the swelling. Lab tests were normal. The radiograph showed expansile cystic lesion with thinning of the cortex at the proximal end of the humerus (Figure 1). The bone scan showed increased uptake at the proximal of right arm. The MRI showed fluid in the bone lesion. Under general anesthesia through a 3–4cm skin incision on anterolateral aspect of proximal arm a window was made. The frozen section pathologic examination demonstrated the cyst to be an ABC, thus endoscopic curettage without bone grafting was performed. Eight months after surgery plain radiograph revealed bone formation and healing of the lesion (Figure 2). Patient was pain free and the shoulder range of motion was near normal. A18yearold right handed female was visited in the clinic with a swelling at the proximal of her right arm since 2 months ago. Again, history and physical examination were normal except swelling and a longitudinal biopsy scar on her proximal right arm. 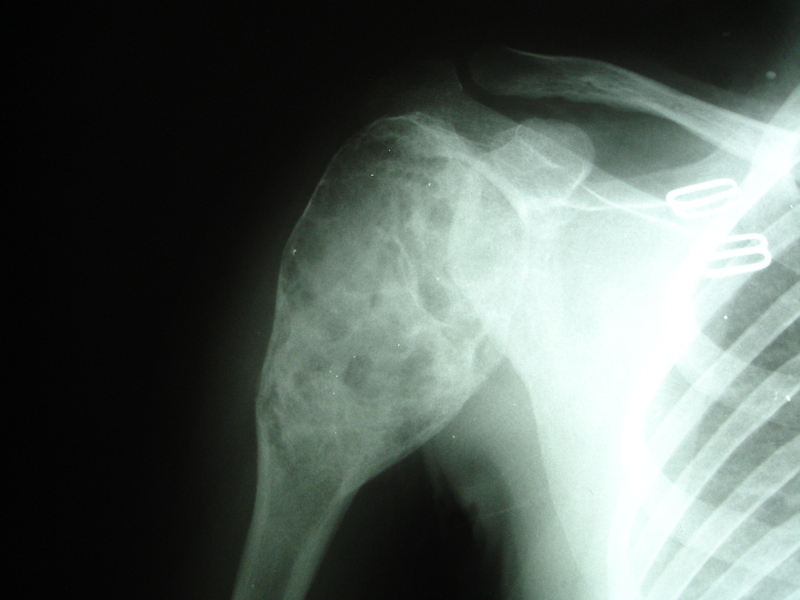 Like the former case, plain radiography showed expansile cystic lesion at proximal end of the humerus (Figure 3). Three weeks before attending our clinic she had undergone an incisional biopsy of the cystic lesion in another center. The pathologic examination revealed the lesion to be an ABC. Endoscopic curettage without bone grafting was performed with the similar technique used for the former case. 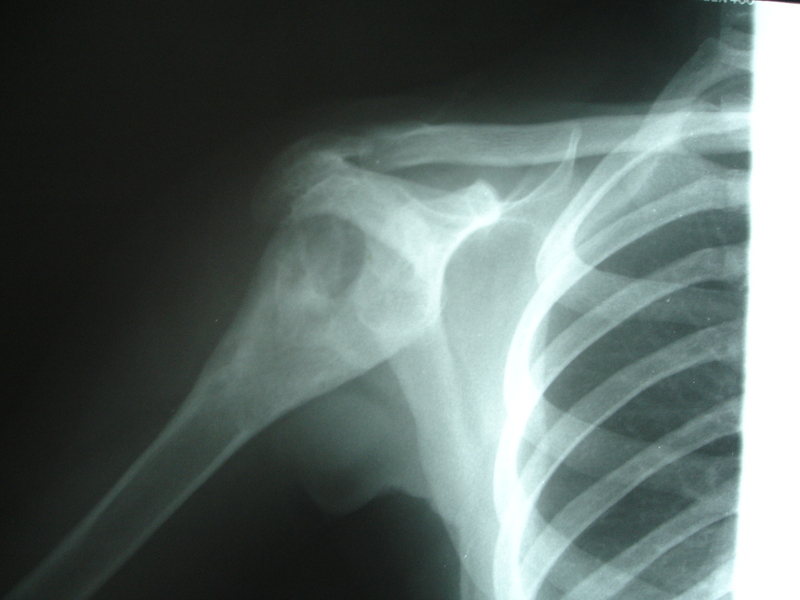 Seven months after curettage, plain radiography showed bone formation and consolidation of ABC (Figure 4). 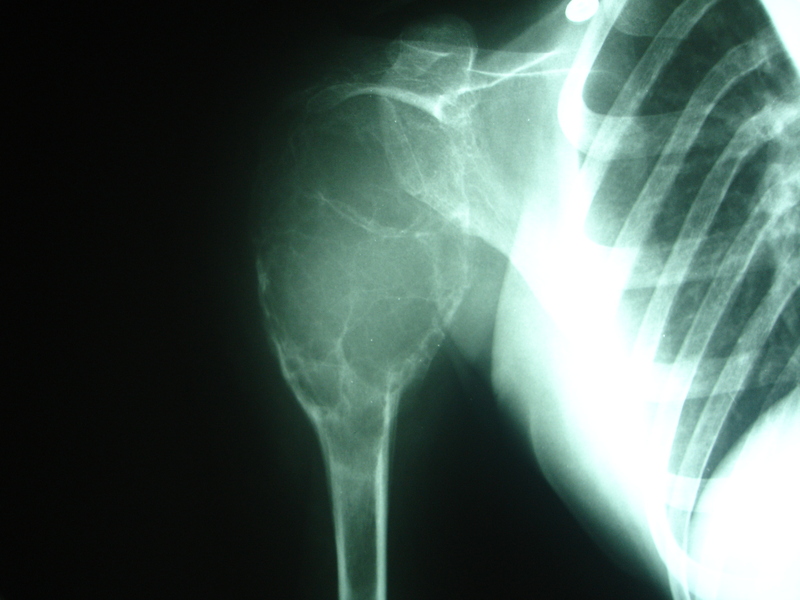 The ABC is an expansile cystic lesion that most often affects individuals during their second decade of life and may occur in any bone in the body but it involves most commonly the proximal humerus, distal femur, and proximal tibia. The accepted treatment of ABCs is curettage and bone grafting (2). The curettage is the treatment of choice for ABC cases. Recurrence rates of 5% to 33% have been reported for curettage, curettage with bone grafting, curettage with irradiation, irradiation alone, curettage with cryosurgery and curettage with bone cementing (6). Radiation therapy is recommended only for lesions that are surgically inaccessible (7). Endoscopic curettage without bone grafting has been introduced in recent years as a new technique in treatment of ABC (4). There are advantages for endoscopic treatment of ABC. It does not need for bone graft so we can avoid donor site morbidity. Endoscopic treatment of curettage requires small incisions so the cosmetic result of this procedure is better than traditional open techniques. Other advantage of this technique is minimal disturbance of weak and thin cortical bone which surrounds the cyst. In 2001, Otsuka et al. (4) treated 4 patients with atypical aneurysmal bone cysts that lacked aneurysmal dilatation by endoscopic curettage without bone grafting. They observed new bone formation and remodeling in all patients. After 30 months of followup there was no evidence of recurrence so they concluded that endoscopic curettage without bone grafting is a simple and effective treatment for aneurysmal bone cysts (4). One year later, Otsuka et al. (5) reported a case of recurrence of an aneurysmal bone cyst in the foot that they had treated with endoscopic curettage without bone grafting. 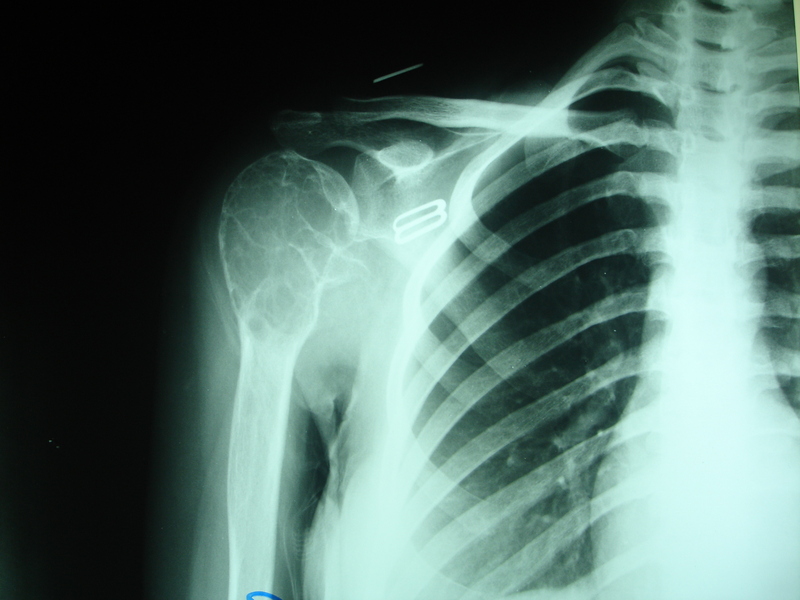 Again bone formation and remodeling were completed in the early stages postsurgically. The patient was asymptomatic with no radiographic evidence of recurrence after 2 years followup (5). All of the reported cases in the literature which have been treated by endoscopic technique were in small tubular bones or were in small size and lacked aneurysmal dilatation. The authors believe that this is the first application of endoscopic technique in ABC of large size and in the proximal of humerus which is one of the most common locations for ABC. We reported good results for endoscopic curettage without bone grafting in two cases with ABC of the proximal humerus and in conclusion we believe that endoscopic curettage without bone grafting is a simple and effective treatment for aneurysmal bone cysts even in lesions with large size.